Here's an EPC "feature" that has stuck around. I have previously described the "Midnight Save & Share." We never studied it closely enough to discover exactly when or why it happened, but if you leave a draft form in your Tasks list (waiting for info or whatever), at some point EPC may decide that you should share your work, and at midnight will Save & Share the form, meaning that it drops into the Tasks list of every user authorized to see the form. It doesn't seem to happen as much as it did back in 2016 and 2017, but it still happens. That's a problem and an improvement. 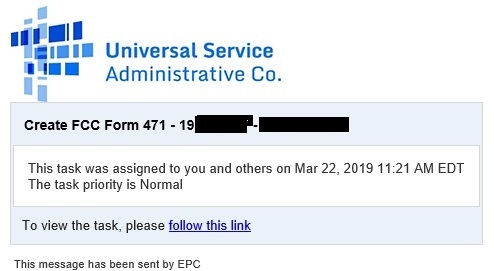 A problem because the person who had the form in their Tasks list isn't notified that the form has appeared in other people's Tasks lists. All authorized users now have that form in their Tasks list, and any of them can now "Accept" that form and move it only to their Tasks list, causing it to disappear from the original owner's Tasks list. An improvement because that email creates confusion. No one who gets that email needs to "Create a Form 471," since the form has already been created; someone needs to continue a Form 471. But some of the people who get the email don't need to do anything. In our case, every time we Save & Share, we can expect an email or call from at least one employee of the client, asking what they should do. Or worse, they just Accept the form and Submit it. At On-Tech, we run into that problem all the time. See, we like to have at least 2 sets of eyeballs view every form before we submit. However, only one person at a time can have access to a draft file, and the only way to transfer a draft from from my Tasks list to yours is Save & Share. So we have to Save & Share every form at least once. Instead of "Save & Share," how about a "Transfer" option? Or maybe when you click "Save & Share," you get to pick who you share with? One improvement that we have seen with "Save & Share." It used to mean "Save & Give Away"; when you shared a form, it vanished from your Tasks list. So you couldn't see the form unless another user Accepted it and then Save-&-Shared it, so it would reappear in your Tasks list. I just have trouble believing that building a portal from the ground up would have been harder than it's been trying to shoehorn the E-Rate process into Appian's business process management platform. Even now, I think we should start from scratch.